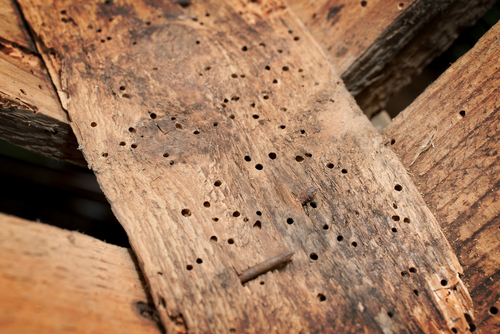 The presence of woodworm is usually recognised by tiny holes in exposed wooden beams and antique furniture. These unsightly holes can easily be overlooked so it’s important to be able to recognise them, particularly if they start to spread as this can indicate a worsening infestation that will require treatment. 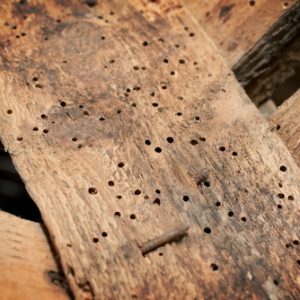 While there are treatments that you can carry out yourself at home, a professional with experience in treating woodworm will ensure the issue is fully cleared and will prevent further damage going unnoticed. There are multiple types of wood boring insect in the UK, each with a distinct wood preference and different indications of an infestation. Some tend to stay nearer lumber yards where they have a buffet of untreated timber while others can make it into our homes. We have put together a quick guide to some of the most common types of wood boring insects which can be found here in the UK. An extensive borer, the Common Furniture Beetle creates rounded tunnels approximately 2mm in diameter going with the grain in both hard and soft wood. Preferring the rotting wood of elm and oak, the Death Watch Beetle creates widespread tunnels across the wood and is often connected to white rot. They extensively fill their tunnels with “frass” or waste which can be clearly visible on inspection. One of the largest wood-boring insects, the House Longhorn creates large 10mm holes that damage deep beneath the surface of the wood, leaving long, sausage-shaped waste pellets. Recognised for its oval-shaped tunnels and soil consistency frass, the Wharf Borer, as its name suggests, prefers buildings along the coast or with extensive damp conditions. Once wood-boring insects have made it into the home, it can be difficult to clear the colony completely. Sometimes they will be brought in during the building process, but these types of insects are also attracted to damp conditions so it is important to ensure that your property is well ventilated with damp-prevention measures put in place. We always recommend seeking professional guidance when looking to remove infestations of wood boring insects or treating woodworm. If left unchecked, these tiny insects can cause untold damage to the structure of the building and its contents. If you suspect that wood-boring insects have made it into your property, give us a call on 0208 535 7536 to find out more about treatment.